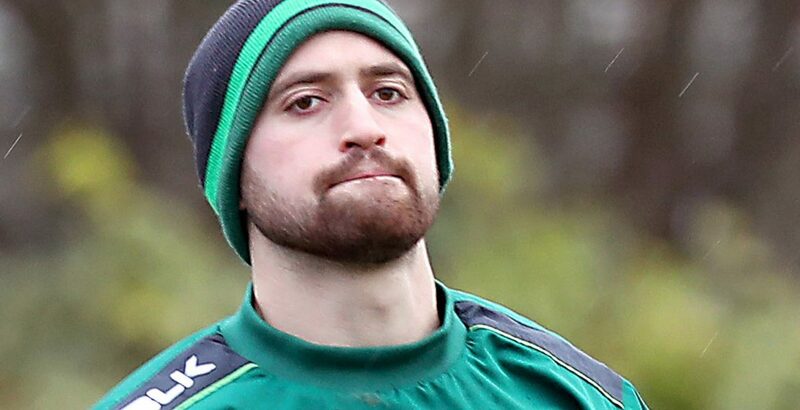 Uncapped Connacht trio Caolin Blade, Jack Carty and Tom Farrell have been named in a 38-man Ireland squad for this year's Six Nations. Ulster lock Iain Henderson is included having made a speedy recovery from a thumb injury that was expected to rule him out for most of the tournament. Grand Slam-winning flanker Dan Leavy is out injured while his Leinster team-mate Ross Byrne misses out. Ireland will begin their title defence at home to England on 2 February. Flanker Sean O'Brien has been included having broken his arm in the autumn win over Argentina while centre Robbie Henshaw has also recovered from a hamstring strain. "There have been a number of tight calls across almost every position," said head coach Joe Schmidt, who admitted that he had struggled to finalise his back row combination. "Those selected could well be joined by Dan Leavy once he's fully fit. With a cohort of young players emerging, it will keep plenty of pressure on the performances of the experienced back rowers who have been selected." Injuries to Luke McGrath and Kieran Marmion have created an opportunity for Blade, 24, to provide cover for first-choice scrum-half Conor Murray with Ulster's John Cooney also included despite a recent back complaint. "Kieran Marmion is not too far away from returning but John Cooney will hopefully be back this weekend for Ulster," added Schmidt. "It's a great opportunity for Caolin Blade to get into camp and compete for a spot." Fly-half Johnny Sexton, who is struggling with a knee tendon issue, is expected to be fit for the opening-weekend match against England at the Aviva Stadium while fellow vice-captain Peter O'Mahony is nursing a rib injury. The inclusion of fly-half Carty, 26, ahead of Ross Byrne and the addition of Tom Farrell, 25, is a reward for Connacht's excellent form this season with second row Ultan Dillane also earning a recall ahead of his provincial colleagues Quinn Roux and Gavin Thornbury. "Johnny is making good progress, while Joey Carbery and Jack Carty have both performed consistently well so far this season," continued Schmidt. "Ross Byrne is unlucky in an incredibly tight call. He is still definitely in our thinking and will continue to press for inclusion through the Six Nations and beyond, while Billy Burns has also fitted in really well for Ulster this season." The Ireland squad will travel to Portugal to hold a four-day training camp from Monday, 21 January.